As experts in network infrastructure design, Americorp International Group provides a broad range of network services with superior security and coverage. We offer intelligent and high performing systems that are scalable for when your company grows. Network requirements vary over time and while your business potentially expands, demands on your IT systems will become extensive. That’s why we analyze the needs of your existing infrastructure before building a scalable network. One that adapts to business growth. 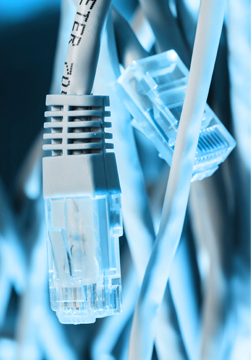 Our qualified engineers are capable of designing, installing, and maintaining new or existing network infrastructure. VPNs have been utilized as cost effective means of providing secure, remote access. Network security is an essential element for any business. We offer complete IT audit services so you can be sure that your data is secure. Our team designs and installs cable networks for small to medium sized businesses using the latest CAT 6 cabling technology. We offer the design and installation of secure wireless networks from full enterprise level systems to less expensive small business installations. As for network installation, our engineers visit your business or office site and create a custom report of their findings and solutions. Our procedure allows for multiple possible solutions to optimize both signal reception and expenditure. Ask yourself this – how much would it cost you to have your computer network down for just one day? Lost orders, the hassle involved in fixing the issue and jobs not completed on time all result in expenses that add up quickly. Losing valuable data from faulty equipment can be catastrophic for any business. Years of money and time easily lost in one instance due to something as common as a hard disk problem. A maintenance agreement with Americorp International Group helps prevent issues and resolves them promptly in the case they do occur. Ensure your peace of mind with AIG. Most business owners tend to think that wireless networks are expensive and complicated to set up, manage, and secure. The truth is, recent technological advancements have made wireless networks a convenient and affordable solution for businesses. Nearly all businesses can take advantage of the addition of wireless networks. Our services handle all aspects of networking from the design, implementation, monitoring, troubleshooting, and securing of wireless network systems for businesses. We pay attention to your unique requirements including network speed and security concerns when designing and implementing your wireless networking system. Americorp International Group is specializes in provides wide range of network services are installation, support, maintenance and wireless networks with superior security, broad coverage and use latest technology. AIG providing best networking solutions in Woodland Hills, California, with offices in Virginia, Washington DC, North Carolina, Texas, and Nevada.